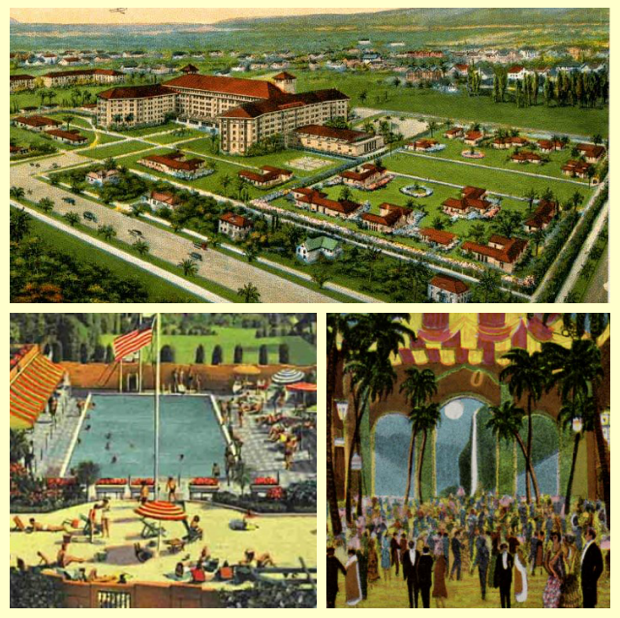 When the Ambassador Hotel opened for business in 1921 the hotel became a favorite spot for Hollywood celebrities and dignitaries alike. F. Scott Fitzgerald, Salvadori Dali, Winston Churchill, Amelia Earhart and every U.S. president from Herbert Hoover to Richard Nixon had visited the hotel. Stars such as Frank Sinatra, Judy Garland, Spencer Tracy, Carey Grant, Clark Gable, Jean Harlow, Ginger Rogers, Bing Crosby, Rudolph Valentino, Benny Goodman, The Supremes, Jimmy Stewart, Henry Fonda, Dean Martin, Jerry Lewis, Marilyn Monroe and Lena Horne were known to either socialize or perform at the hotel's famous nightclub, The Cocoanut Grove. Six Academy Awards ceremonies were held at The Cocoanut Grove, including the ceremony in 1939 when Hattie McDaniel, the first African-American to win Best Supporting Actress, accepted her award. And unfortunately, on June 5, 1968, it was at the Ambassador Hotel that Robert F. Kennedy was assassinated. 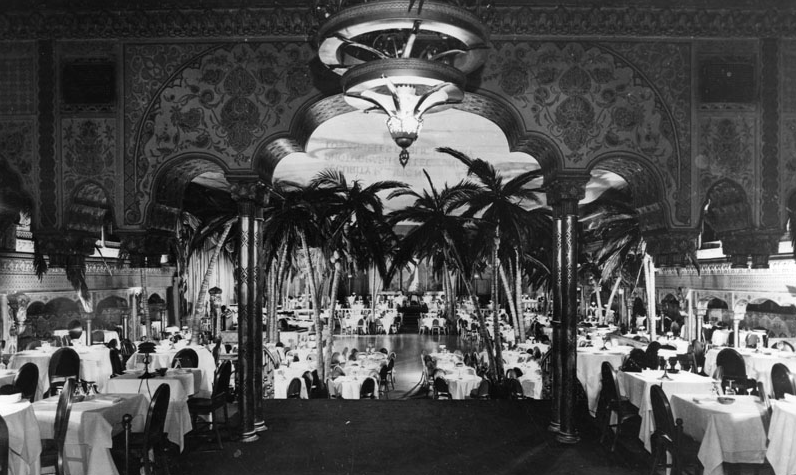 The Cocoanut Grove nightclub inside the Ambassador Hotel. What was once considered the "Crown Jewel of Wilshire Boulevard" would eventually close its doors in 1989. 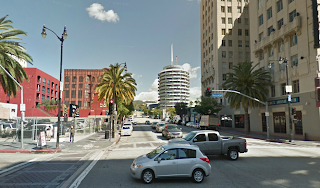 For the next 15 years the fate of the Ambassador Hotel was debated. There were those who wanted to preserve the historic building and a school district that felt the best option was to tear the building down and build a new campus on the site. Filmmaker Camilo Silva is now putting together a new documentary on the history and controversial demolition of The Ambassador Hotel called After 68: The Rise and Fall of The Ambassador Hotel and YOU can help him out. There is currently a Kickstarter page up where you can contribute to the project. If you would like to see this documentary made and want to pitch in on the effort, visit the After 68 Kickstarter page to learn more. A trailer for the documentary can be viewed above. 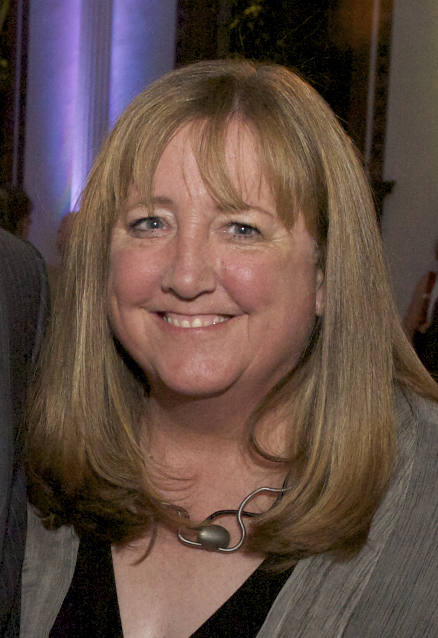 Linda Dishman, Executive Director of the L.A. Conservancy. Talking Old Hollywood is a regular series on Dear Old Hollywood where writers, filmmakers, fellow bloggers, artists, historians, or pretty much anyone who is interested in classic movies will have a chance to highlight projects they are working on, share a little of their background and discuss their interest in old Hollywood and classic movies. This week Linda Dishman, the Executive Director of the Los Angeles Conservancy, talks about everything from preservation, events organized by the L.A. Conservancy including classic movie screenings in historic theatres, to where you can have an old Hollywood style wedding. Linda, what got you interested in preservation and how did you get involved with the Los Angeles Conservancy? 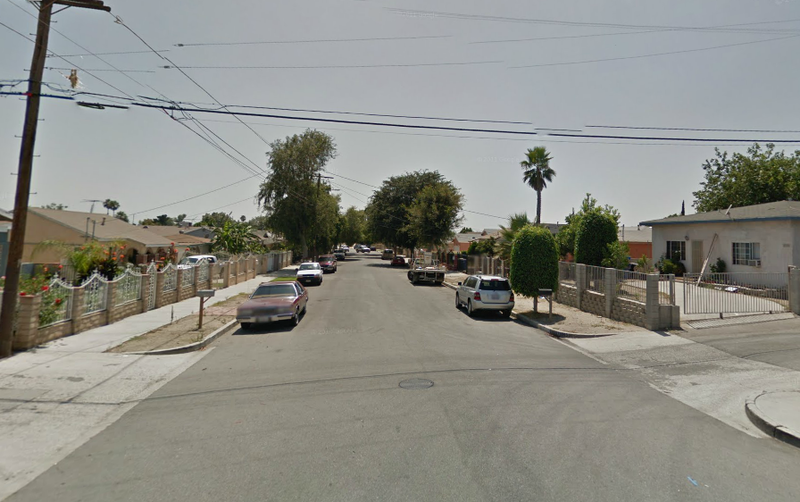 When I was young, we would visit my grandparents and aunts and uncles who lived about an hour away. On each trip, we would drive by the hospital where I was born. This sense of my parents celebrating something that was important to them (my birth) was meaningful and powerful, and it cemented for me the role that buildings have in telling stories. I was familiar with the L.A. Conservancy when I lived and worked in Pasadena in the mid-1980s, and I even took several of the tours. I had worked in preservation at the local, state, and national levels of government, and I was ready to approach preservation from a different perspective when the Executive Director position was advertised. What I particularly liked about coming to the Conservancy was the combination of advocacy and educational efforts in saving the places that matter to Angelenos. Are there any Los Angeles area buildings you are especially proud of that you were able to save? I have to say that my favorite "win" is the former Cathedral of St. Vibiana (now known as Vibiana), which dates to 1876 and was designed by the first licensed architect in Los Angeles. It was one of our toughest, and ultimately most successful, preservation efforts. We didn't just prevent the building's demolition. We found a preservation-friendly buyer and brought in eleven architectural firms to create a new vision for the building so people could see the possibilities. Saving Vibiana was a real turning point for the Conservancy. We were up against the entire power structure of the city, including the Catholic Archdiocese who owned the building. In many ways it was a defining moment for us - a real "gut check" in terms of how hard we would fight to save an important building. Our work saving Vibiana also helped change people's attitudes toward the Conservancy and preservation, which is almost as important as saving the building itself. We stood up for this building, and people took notice. 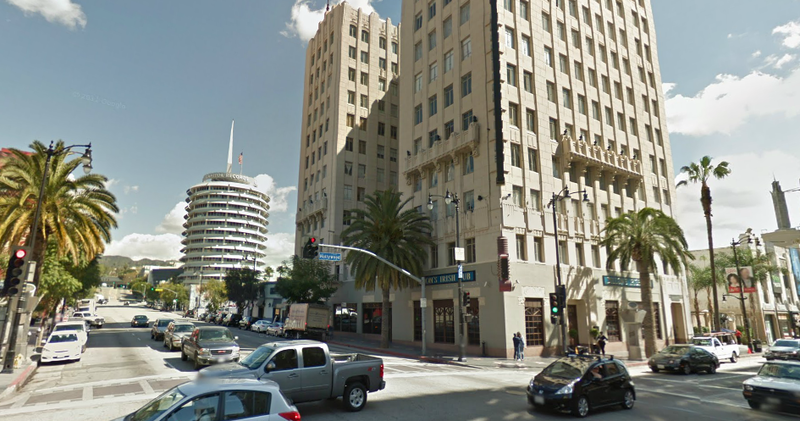 Are there any Los Angeles buildings you wish could have been saved, but unfortunately lost the preservation battle? I would say that our most disappointing loss is the Ambassador Hotel, which we spent two decades trying to save, including filing several lawsuits. We tried hard to adapt the hotel into a school for a school district that wanted a new building. When adaptive reuse was no longer an option, we shifted our plans...several times. We showed them how to build classrooms around the hotel building, and then how to turn the hotel into affordable housing. A developer is all about the bottom line, and we can often work with that and find a middle ground, but in this case, the school district steadfastly maintained that their need to tear it down was more important. There was just no getting around that. Volunteer docent Randy Henderson leads one of the Conservancy's popular walking tours. Photo by Deissy Flores. 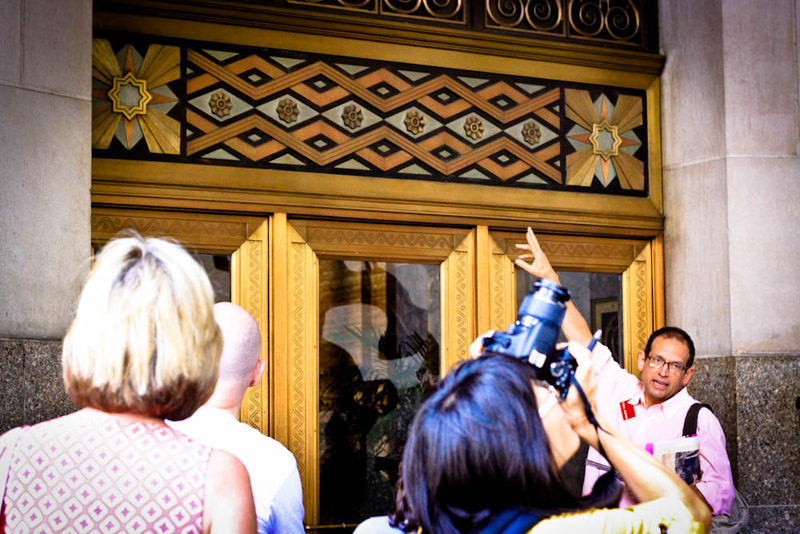 The Los Angeles Conservancy puts on many events and tours that the public can participate in. Can you tell us about those events/tours? We've always had a twofold mission of advocacy and education, because raising awareness of historic places is essential to building support for their preservation. 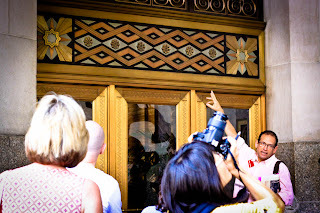 We have a very popular series of eight regular walking tours that explore various aspects of architecture in and around downtown L.A.
Each spring and fall, we also hold a one-time-only special tour to spotlight a particular geographic area, architect, style, or other topic. We often pair those events with panel discussions or other public programs to delve a little deeper into a topic. We also have important fundraising events, such as our annual Preservation Awards Luncheon that honors outstanding achievement in the field, as well as benefits at spectacular private homes. 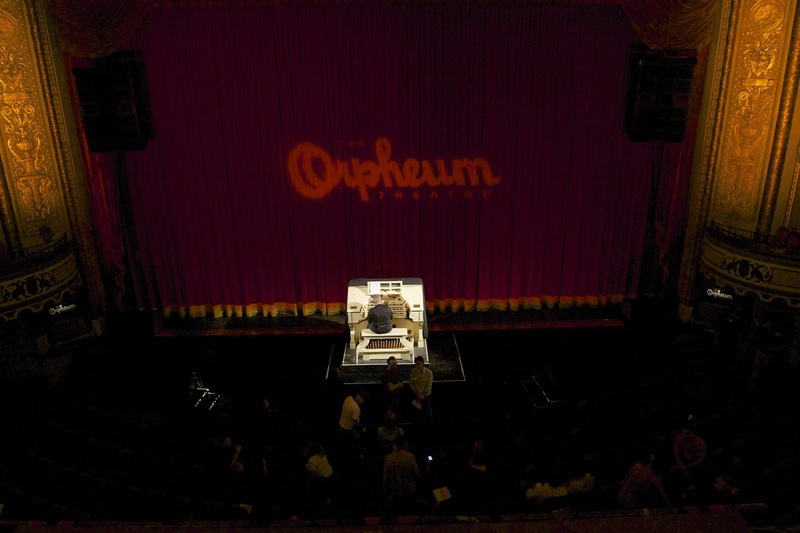 And of course, our Last Remaining Seats series of classic films in historic theatres draws over 10,000 people each summer into the wonderful historic movie palaces of Los Angeles. Linda Dishman welcoming guests to the 1930 Saban Theatre for a 2012 Last Remaining Seats screening. Photo by Larry Underhill. Last Remaining Seats is one of my favorite events. Is there any possibility of that becoming a year round program? Perhaps if our mission focused on historic theatres, but we work to preserve all types of historic places throughout Los Angeles County, so we have lots of other things to do! Last Remaining Seats won't be a year-round Conservancy program. 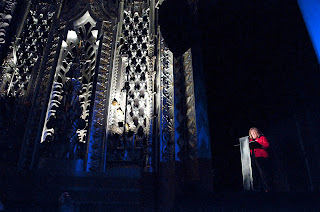 But we are thrilled to see more organizations start to program these venues with classic films or other entertainment. That was one of the main goals of starting the series back in 1987 - to prove the viability of these theatres in drawing audiences today, even though it may take creative new types of programming. Now that I have a young daughter, I'm already thinking of opportunities to expose her to Los Angeles history. Does the L.A. Conservancy have any events/activities that are good for families? Absolutely. We offer versions of our Historic Downtown and Union Station walking tours tailored specifically for youth and families, and our website has a number of downloadable guides and activities for youth and families that are perfect any time. And our annual matinee features a classic family-friendly film. 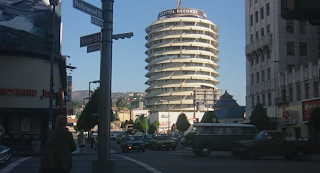 One of the regular features on Dear Old Hollywood are posts showing filming locations for classic movies. Is there a classic movie or are there a few classic movies you enjoy because of the way Los Angeles is portrayed as a location? Great question. They really run the gamut, from downtown in the great silent films of the 1910s and 1920s to the 1970s depiction of 1930s Los Angeles in Chinatown. 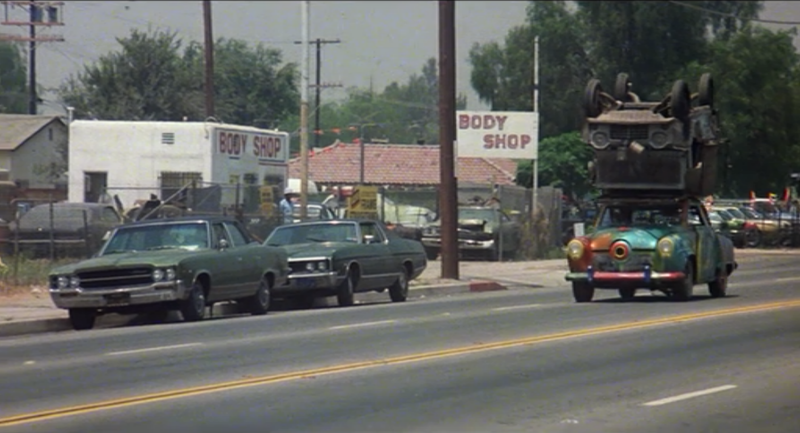 Every single time I drive by the Archer School for Girls in Brentwood I think of Chinatown. 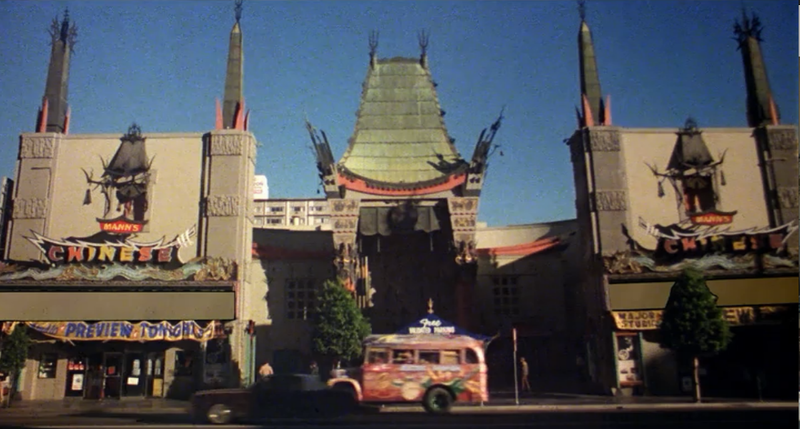 If you could travel back in time to another era of Los Angeles for a dinner and a movie date night, which L.A. restaurant would you eat at and which theatre would you see your movie? Hands down, opening night of the Los Angeles Theatre would be an amazing time travel experience - everyone dressed to the nines, watching the premiere of Charlie Chaplin's City Lights and experiencing the Los Angeles Theatre for the first time. 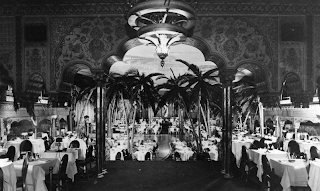 Do you have a favorite "old Hollywood" restaurant or bar that is still around? I love Musso and Frank. Not only does it look historic but the staff is so old school that you feel as though you have stepped back in time. One question I get asked a LOT from people who are getting married is where they can have an old Hollywood style wedding. 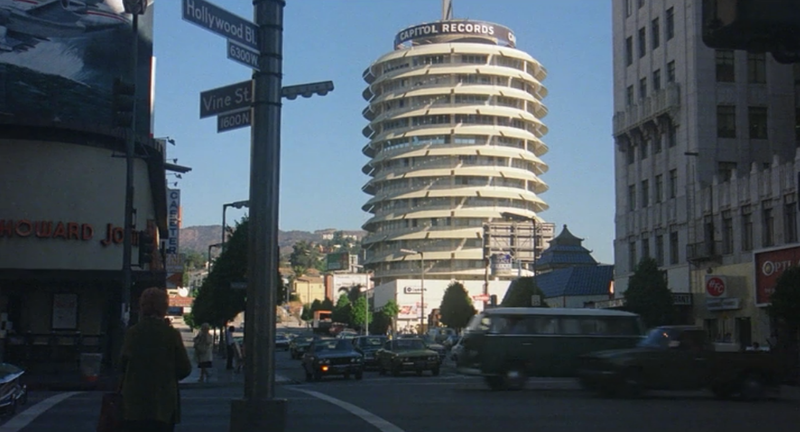 Are there any Los Angeles locations with "Hollywood" history that are available for weddings? Oh yes - from the King Gillette Ranch in Malibu to Greystone Mansion in Beverly Hills to a yacht once owned by John Wayne. We have dozens on our online list of historic sites available for special events. Who can get involved in the Los Angeles Conservancy and what do they need to do? What kind of opportunities are there? Anyone! There are lots of ways to get involved with the Conservancy, from becoming a member, to volunteering, to hosting a special event, to sharing their great photos of historic places, and more. Just visit our website for more information. The Orpheum's Mighty Wurlitzer organ, the last remaining theatre organ on Broadway. Photo by Gary Leonard. 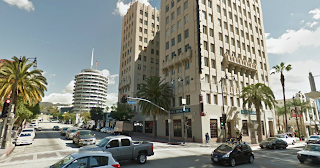 What's coming up next for the Los Angeles Conservancy? We'll wrap up this season of Last Remaining Seats in late June (with screenings of the silent Ben-Hur June 26 and Casablanca June 29). We're hard at work on a number of preservation issues, including preventing demolition of L.A.'s first large-scale garden apartment community. Our special spring/summer program, Curating the City: Modern Architecture in L.A., continues through July. And we're planning great new programs for the fall. Every day's a new adventure at the Conservancy! Thanks Linda. That was fascinating! 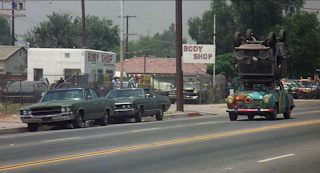 This is the second of two posts on The Muppet Movie (1979) film locations. For part one, click here. In The Muppet Movie, Kermit the Frog leaves the quiet swamps to make it as a successful rich-and-famous frog in Hollywood. 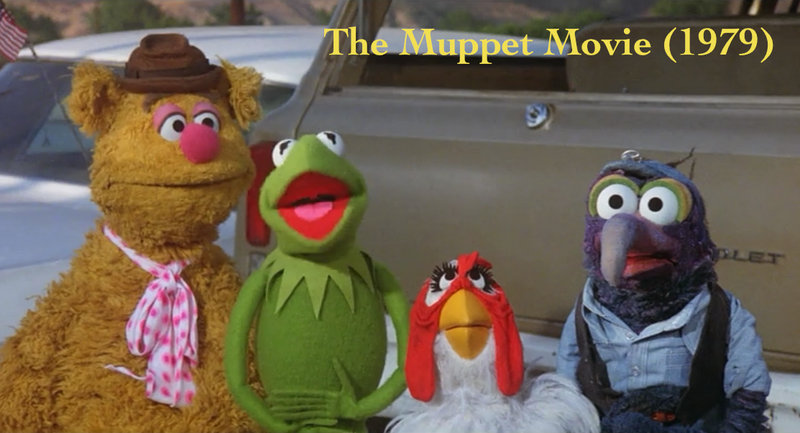 During his road trip to Hollywood Kermit acquires many Muppet friends who join him on his trip, including Gonzo, Camilla, and Fozzie Bear. This post highlights some of the locations that appear when Kermit and gang arrive in "Hollywood." This first location is "World Wide Studios," the film studio where the Muppets show up and Orson Welles, the studio mogul, requests a "standard rich-and-famous contract" be prepared. 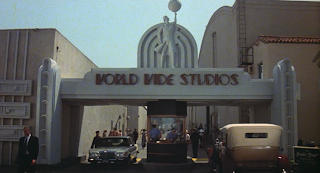 World Wide Studios is really what is today CBS Studio Center, a film and television studio located at 4024 Radford Avenue, Studio City, California. The World Wide Studios entrance is a fake entrance constructed between a sound stage and another building on the lot. I didn't have a contemporary photo showing this area of the lot, so below is a screenshot from an episode of Bob Vila touring CBS Studio Center showing how the location looks without the fake World Wide Studios entrance. World Wide Studios is really the CBS Studio Center lot. When the Muppets arrive in Hollywood they pass in front of the iconic Hollywood sign. 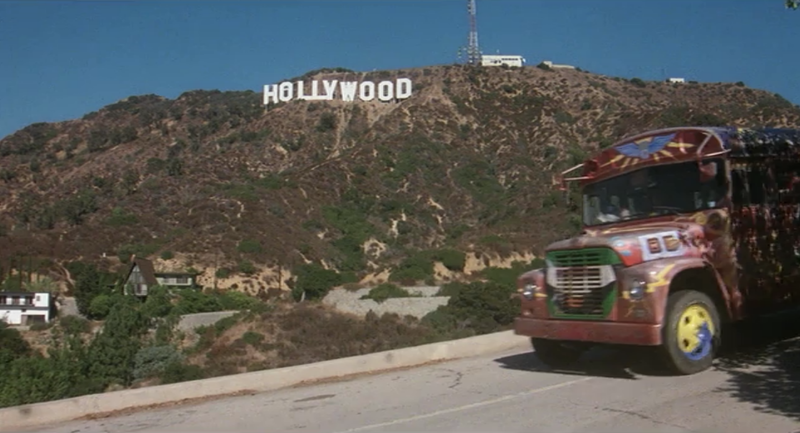 The Electric Mayhem bus drives down the Mulholland Highway. The Muppets pass the Hollywood sign. 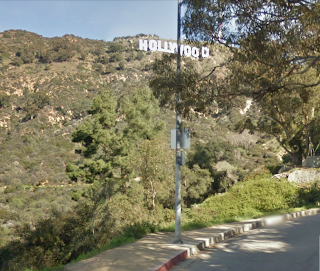 The Hollywood sign seen from Mulholland Highway. 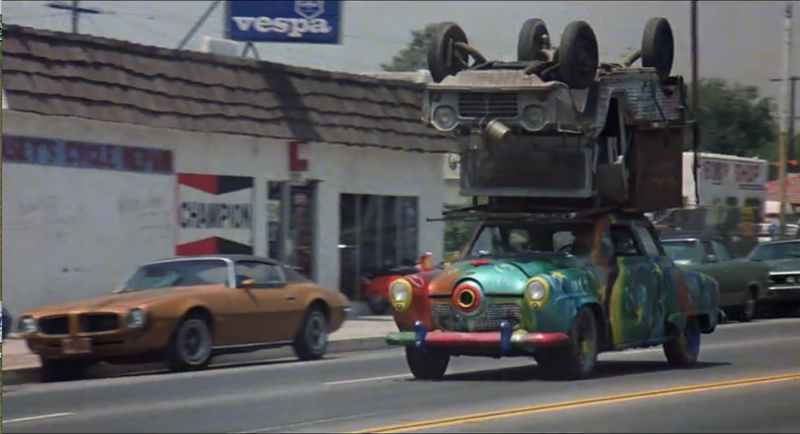 The Muppets then drive down Hollywood Boulevard heading west and crossing Vine Street. The landmark Capital Records building can be seen in the background as they pass. 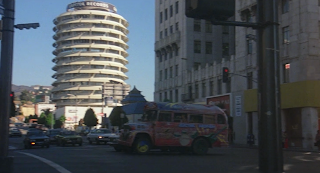 The Electric Mayhem bus crosses Hollywood and Vine. Looking up Vine Street from Hollywood Boulevard. 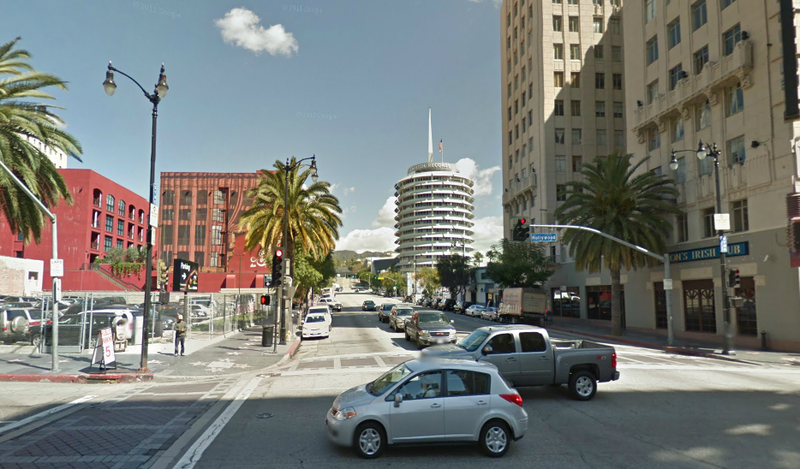 A second view of Hollywood and Vine showing the Howard Johnson. Hollywood & Vine. The Howard Johnson building is long gone. 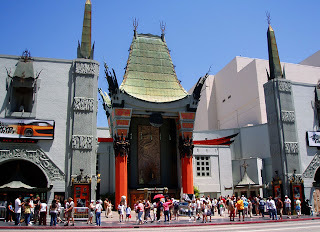 As the Muppets continue down Hollywood Boulevard they pass the Chinese Theatre. The Muppets pass the Chinese Theatre. A contemporary view of the Chinese Theatre. Trivia: According to Imdb.com one of the old Hollywood cameo appearances in The Muppet Movie is Edgar Bergen and his wooden puppet, Charlie McCarthy. Bergen died shortly after his scene was filmed in 1978. 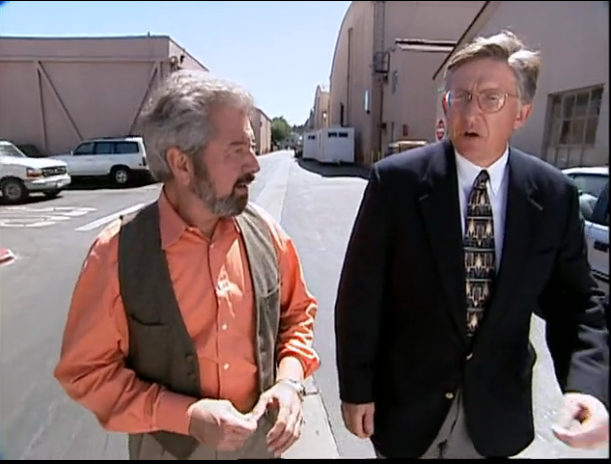 Having Bergen and McCarthy appear in the film was important to Henson as Bergen was a major reason why Henson got into puppetry. 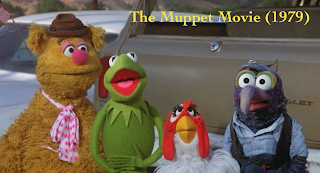 Of the many cameos in The Muppet Movie, which one is your favorite? Fozzie, Kermit, Camilla, and Gonzo want to buy a used car. One of my favorite films as a kid was The Muppet Movie (1979), so I was delighted while watching this movie recently, to see my young daughter already getting into the film. She was especially interested in the music, like the songs Rainbow Connection and Movin' Right Along. As soon as the songs would start she would stand up in front of the TV and do a little dance while watching the Muppets sing. I have a feeling it was this film along with the Muppet television show that developed my early fascination with old Hollywood. Both the film and TV show featured many cameo appearances by many classic Hollywood stars. 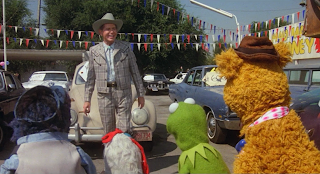 In The Muppet Movie alone there are scenes with Milton Berle, Mel Brooks, James Coburn, Bob Hope, Edgar Bergen, Orson Welles and many other stars. I hope this film might be a gateway film to interest my daughter into some older classics. 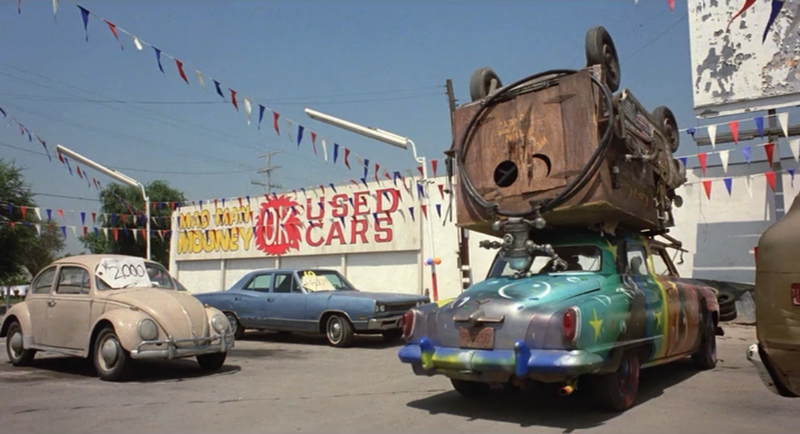 One thing I spotted while watching the film this time is the location for Mad Man Mooney, the used car lot where Milton Berle tries to sell Kermit and gang a beat up Volkswagen bug. A few years ago I got lost in this location as it is an area I rarely would have reason to go, but the location stayed in my mind. 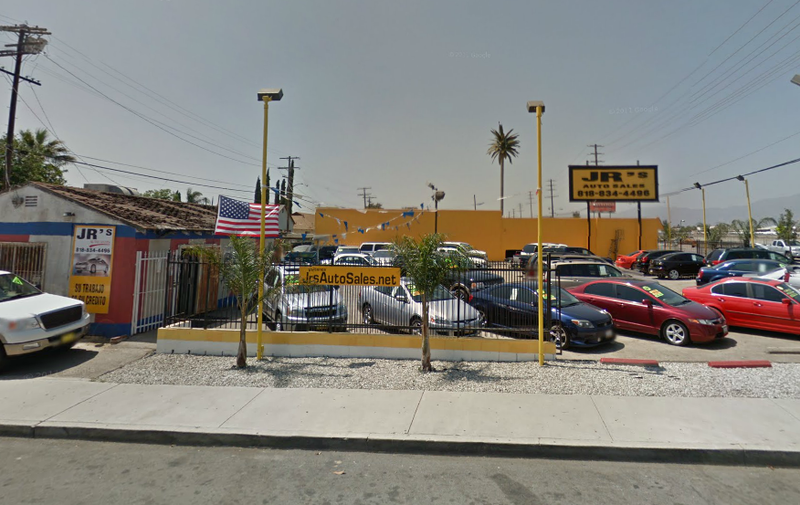 The used car lot is located on the corner of San Fernando Road and Kelowna Street in Pacoima, California. Below are comparisons showing the location in the film with images of the same area today. 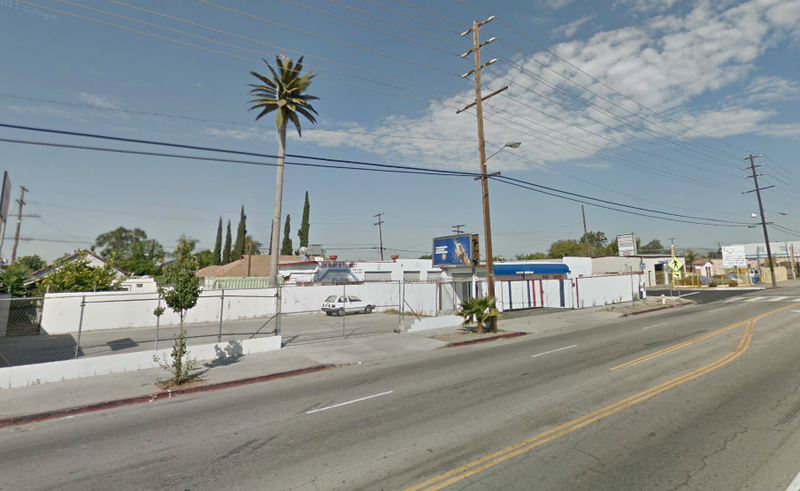 Looking towards 10265 San Fernando Rd. In the first comparison the area has changed quite a bit. The small square body shop building is now gone and has been replaced by a larger body shop building. 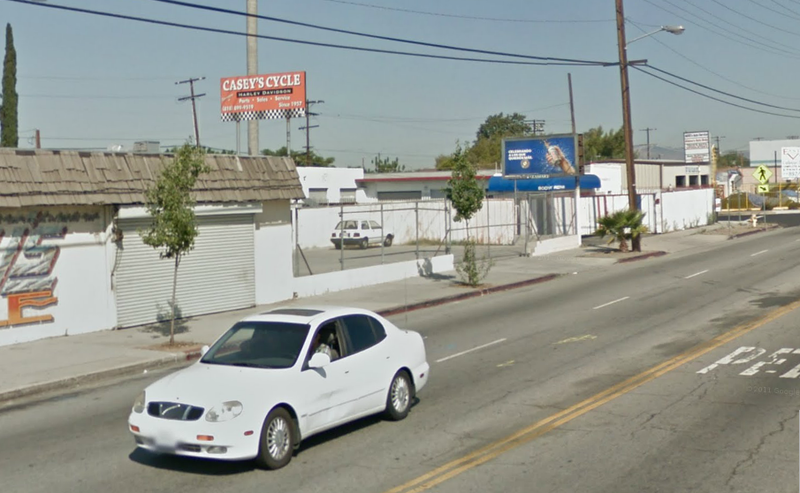 Casey's Cycle Repair, San Fernando Rd. 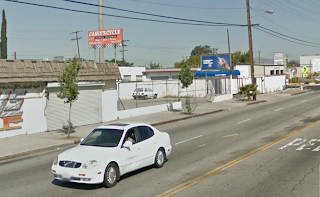 In the next comparison we can see that the Casey's Cycle Repair shop located at 10249 San Fernando Road is still standing and still in business! Looking down Kelowna Street from San Fernando. Looking down Kelowna St. from San Fernando. The Muppets make a right from San Fernando Road on to Kelowna Street and then turn into the driveway of Mad Man Mooney Used Cars, presently the site of JR's Used Cars. 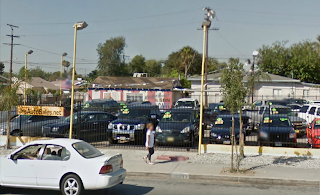 I think it is amazing that years later the little used car lot building is still painted in the all American colors of red, white and blue. 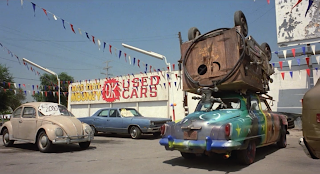 The Muppets pull in at Mad Man Mooney's Used Cars. 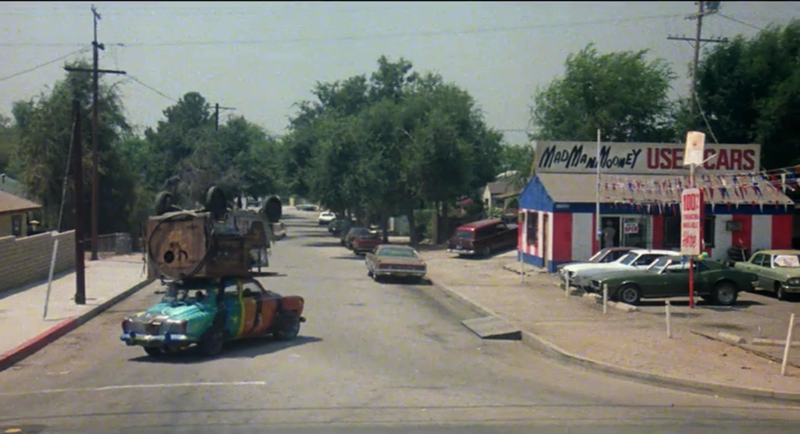 JR's Used Cars is the site of Mad Man Mooney's. Milton Berle tries to sell the Muppets on a piece of junk. The Muppets trade in their Studebaker. 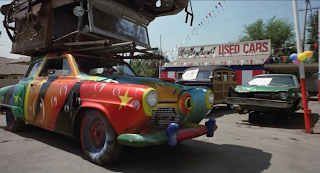 Mad Man Mooney's Used Car lot. 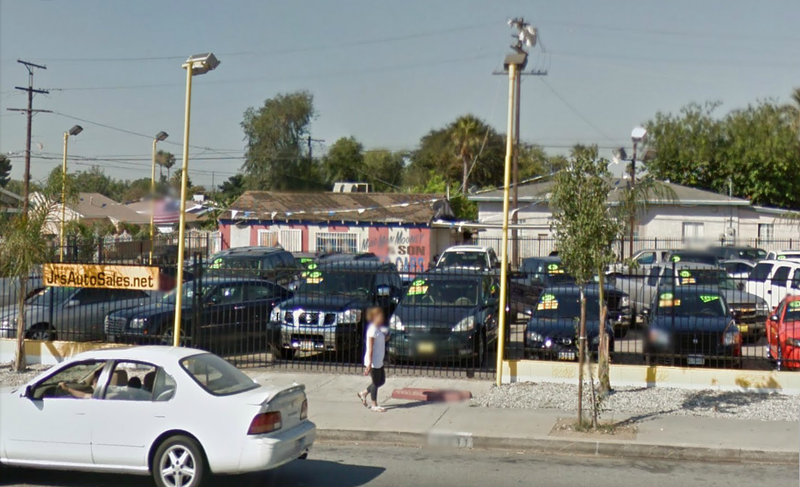 Another thing I think is incredible is that the used car lot is still hanging the same red, white and blue triangle banners 34 years later. 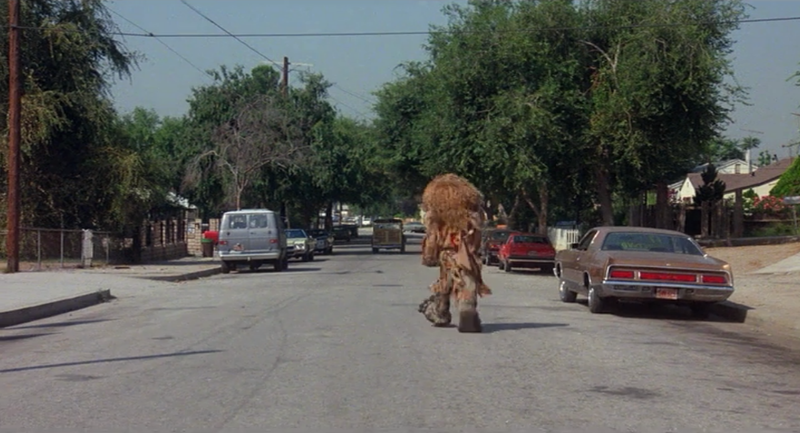 Sweetums runs down Kelowna Street after the Muppets. Looking down Kelowna Street from the used car lot. 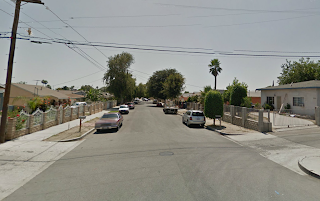 The last comparison shows Kelowna Street as seen from San Fernando Road. 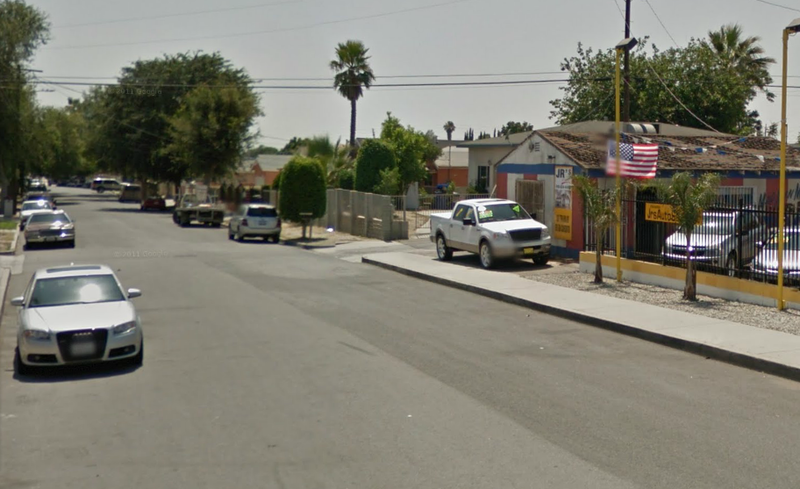 The entrance to the used car lot is on the right. In the screenshot we see the muppet Sweetums running out of the car lot and down Kelowna after Kermit, Fozzie, Gonzo and Camilla. 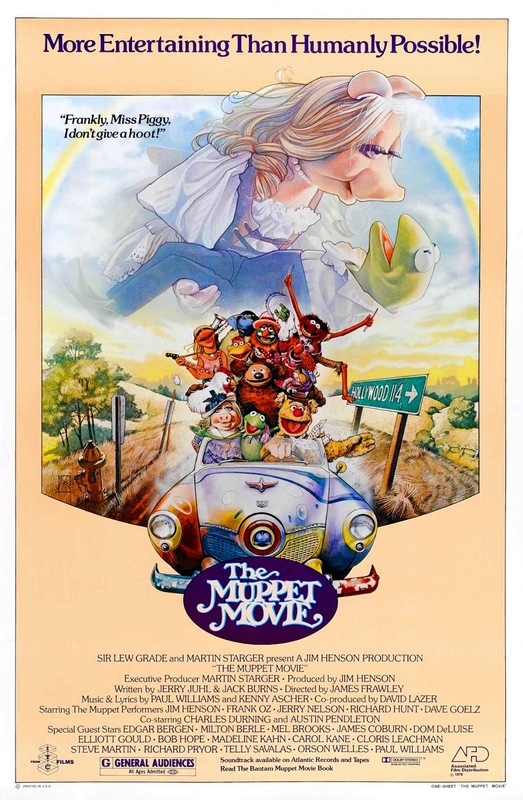 The Muppet Movie (1979) is available on DVD and is currently available for streaming on Netflix. "The nearly 35th Anniversary" edition will be released on August 13, 2013 on Blu-Ray. 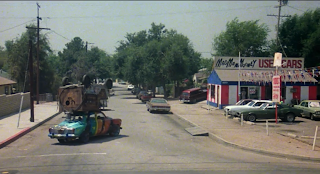 To see more The Muppet Movie (1979) film locations click here. 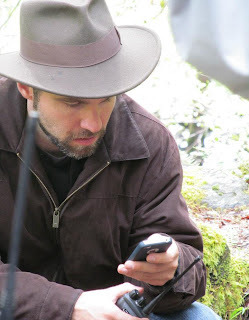 Andy Gunn on set of LOVE IN THE TIME OF MONSTERS. Talking Old Hollywood is a new series I plan to feature on Dear Old Hollywood where writers, filmmakers, fellow bloggers, artists, historians, or pretty much anyone who is interested in classic movies will have a chance to highlight projects they are working on, share a little of their background and discuss their interest in old Hollywood and classic movies. First up is Andy Gunn, a producer of a new monster movie filmed in Northern California called LOVE IN THE TIME OF MONSTERS. Andy, what's LOVE IN THE TIME OF MONSTERS about and who was involved in the film? LOVE IN THE TIME OF MONSTERS is a horror comedy about two sisters who travel to a cheesy tourist trap where they battle toxic monsters dressed in bigfoot suits in order to save the ones they love. Try saying THAT three times fast! A group of my friends in LA all had done a successful short film called "Background(ed)" around 6 years ago, and we had gone our separate ways; we worked in all sorts of industry jobs. I was a page at Paramount and went to UCLA producer's program, along with producing some other projects. The director Matt Jackson became a successful story editor on Reality TV, etc. Mike the writer had been working on this great script with us since 2008! Towards the end of 2010 I finally said we have to do this thing or it's not going to happen. So here we are, 2-5 years later, with a movie I'm really proud of. Can you tell us about the location for this film? Where did you shoot the movie? We shot the film at the historic Patrick Creek Lodge in Gasquet, California. Surrounded by redwoods, the lodge has been there for over 100 years! Mike (the writer) found it while driving through California, looking for inspiration - and boy did he find it! In fact, the Patrick Creek Lodge was so perfect it seemed like it had sprung out of his mind. Shooting there was great; not only could we house the cast and crew, but the production value was immense. It was a little like summer camp up there, and everybody bonded while we shot, we really became like a family. The locals in Gasquet and Crescent City were very helpful as well, and we couldn't have done it without them. The tourist trap soon to be invaded by zombie Bigfoots. What was most challenging making this movie and what was most fun? Most challenging was always having so little money to do the things you had to do to make the movie the way you want. But it's really true what they say about being more creative under those circumstances. The whole process was so much fun! Seeing it all come together piece by piece was amazing and truly the best part of a producer's job. Never underestimate the power of "mind over matter"; just getting good people to truly commit to something, they will find a way to get it done. What's next for LOVE IN THE TIME OF MONSTERS? As someone now making films, what films have inspired you and do you have a favorite classic movie? My all time favorite and most influential film was BRAVEHEART, which I saw in the theater at 14, and really effected me on every level. I just love epic filmmaking, so BEN HUR is a big favorite as well. I also love ONCE UPON A TIME IN THE WEST, which somehow keeps you totally engaged for 3 hours with a minimal amount of dialogue. The great characters, music, direction are all first rate. Claudia Cardinale doesn't hurt either. My favorite Hitchcock movie is probably NORTH BY NORTHWEST. How did you get into classic movies? Did someone turn you on to classics or did you seek them out on your own? My parents were big time movie fans, so they showed me all kinds of films growing up. I started to seek them out as I got older as well. I always try to see classic movies that keep coming up in conversations so I know what everybody is talking about. Who is your favorite classic film star and/or actress and is there a particular reason why? Probably Charles Bronson. He just seems like an unlikely movie star, which I love. Did so much with so few lines - you just believed him. So good. Is there a classic film you enjoy that you wish more people would see? The Sand Pebbles with Steve McQueen. It's a great epic film that has everything you could want in a movie. Great historical fiction as well, which is one of my favorite genres. That movie sticks with you after you see it. One final question. 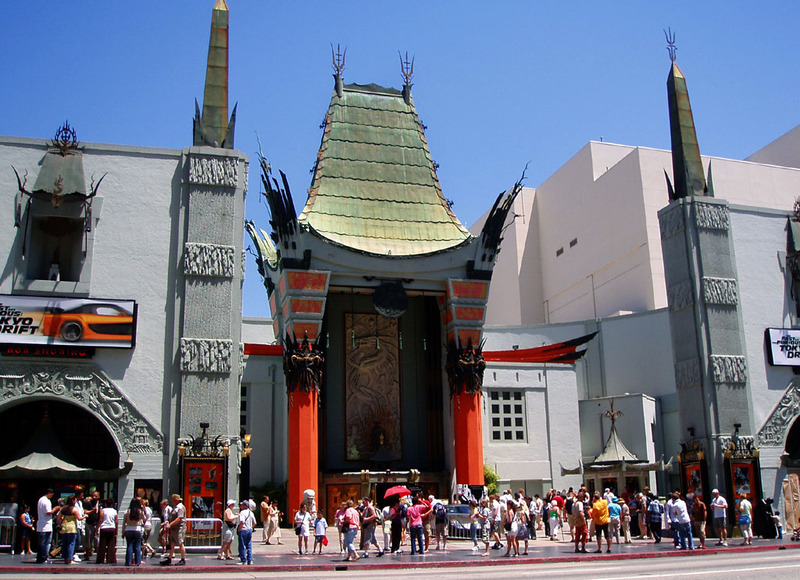 As someone living and working in Hollywood, do you have a favorite "old Hollywood" haunt (such as a restaurant, nightclub, theatre) or old Hollywood experience? 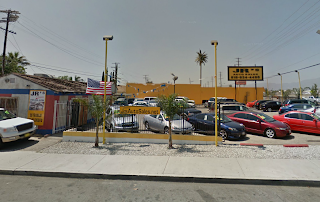 I'm a lucky guy and got to work at Koontz Hardware in West Hollywood/Beverly Hills. Saw lots of movie stars through the years. My two favorites were probably Barbara Streisand and Burt Reynolds. When Burt walked in, I was thinking "this guy must get mistaken for Burt Reynolds all the time" until I realized it was him! Thanks Andy for your time.